Golden Crown Haifa is set in Haifa, 2 km from Haifa’s Municipal Theater, and provides free WiFi. With a terrace, the property also has a shared lounge, as well as a bar. 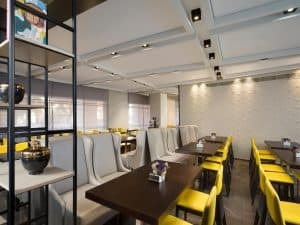 The property is close to popular attractions like Haifa Port, The Quiet Beach and Rambam Medical Center Haifa Israel.Guest rooms in the hotel are equipped with a coffee machine. Featuring a private bathroom with a shower and free toiletries, some units at Golden Crown Haifa also provide guests with a sea view. At the accommodation, each room is equipped with air conditioning and a flat-screen TV. Breakfast is available daily, and includes buffet and kosher options. Languages spoken at the reception include Arabic, English and French. Rambam Medical Center Haifa Israel is 1.3 km from Golden Crown Haifa, while Baha’i Gardens and Golden Dome is 1.6 km away. This is our guests’ favourite part of Haifa, according to independent reviews.